The first way to be reborn into the spiritual world is to go to the messengers of God and through the messengers of God to the Holy Spirit – I Am. To and through this method is called. Unfortunately far too many believers stop at to and don’t go through! they are reborn into the water but not into the spirit/fire. There is a second way of being “Reborn” into the spiritual world. 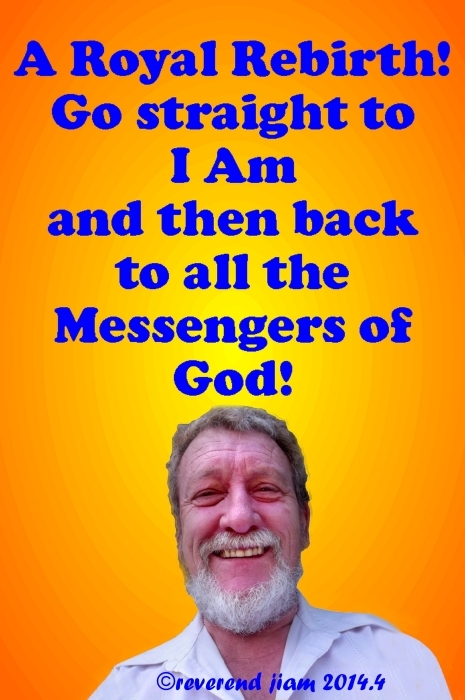 And that is to go straight to the Holy Spirit, I Am, and from there back to the messengers of God. The first way is to go to the water first and then to the fire(spirit). The second way is to go to the Fire first and then back to the water! I know of at least two people who have experienced this form of rebirth in the last 100 years. One is Mahatma Gandhi and the other is myself. There are probably many, many I don’t know about. If you have already been reborn this way please contact me that we may create a synergy for peace and harmony. One of the evidences of Gandhi’s royal rebirth is the way he flipped from the Hindu to Christian and then Muslim Teachings. You see the royal rebirther knows that there is no difference in the LOVE teachings of any of the messengers. The only difference of the teachings of the messengers are in the social rules of that particular age. This process of the messengers is called continuous manifestation! God is the headmaster of the school and each messenger is a teacher in the school. Each year we advance to a higher level of responsibility in social teaching – unless we are obstinate and refuse to advance; then we stay in the class we were in. Look at the jews. They still have their religion but they don’t practice many of the social rules any more. There are multiple pages of death penalties for Jews some like, “getting information from the dead” e,g spiritualism. Today none of those death penalties are carried out – why? Because the rules of the following manifestation nullified them and , although denying the later manifestation his ruling were carried out by the Jews! Another example is the concept of Holy War. This was never a part of Christianity, but was introduced by Muhammed. But in the 12 to 14th centuries the Christians waged “Holy War” against the Muslims! And today nearly everyone alive is living under the new social teachings of the new age! We live in an age of miracles and people take them entirely for granted! It is very hard for people to understand the universality of God if they are reborn in to one religion, because they are immediately taught that the religion they are reborn into is the only one that is true. What the world needs is more people who are born directly into the Holy Spirit – I Am! I was born directly into I Am because I had been an atheist for 14 years and I asked the question of God, “If you exist, please show me!” I was sent a christian person to help me to the stage of rebirth, but once reborn I was walking down the passage and God said to me, “I want you to become a Baha’i!” And I said, “A what?” (yes, I know it was terribly rude of me to speak to God in this way, but i was totally taken aback!) “A Baha’i!” Okay, so I have to become a Baha’i but where on earth would I find them, so i asked God, “where will i find these Baha’is?” “In the phone book!” God told me. So i went to the phone book and sure enough there they were! So i phoned them up and asked them to come around straight away, only to be told that they were “too busy”, so I asked them when they could come around? “The next day” i was told. So I went out and spent my first spiritual day on earth in a state of ecstasy and Bliss! Birds fluttered around my head, dogs came up and licked me and people instantly beamed smiles the moment i caught their eyes! Also I walked “An inch off the ground!” all day. 20 years later I was asked to leave the Baha’i faith (by God) and i didn’t want too. So God took the Holy Spirit off me and within two days I had left! As soon as I had left the Holy spirit was given back to me and i returned to the direct path of I Am. My 20 years in the faith were mentoring years, where i learned the lessons of the messengers of God. Once I had learned all i needed to know, I was asked to leave. I was then given a mission to perform – God works in mysterious ways, His wonders to perform! Posted on April 6, 2014, in Uncategorized and tagged continuous, direct, God, holy spirit, I Am, messengers, one, peacemaker, rebirth, revelation, reverend master j'iam, Royal, unity. Bookmark the permalink. Leave a comment.